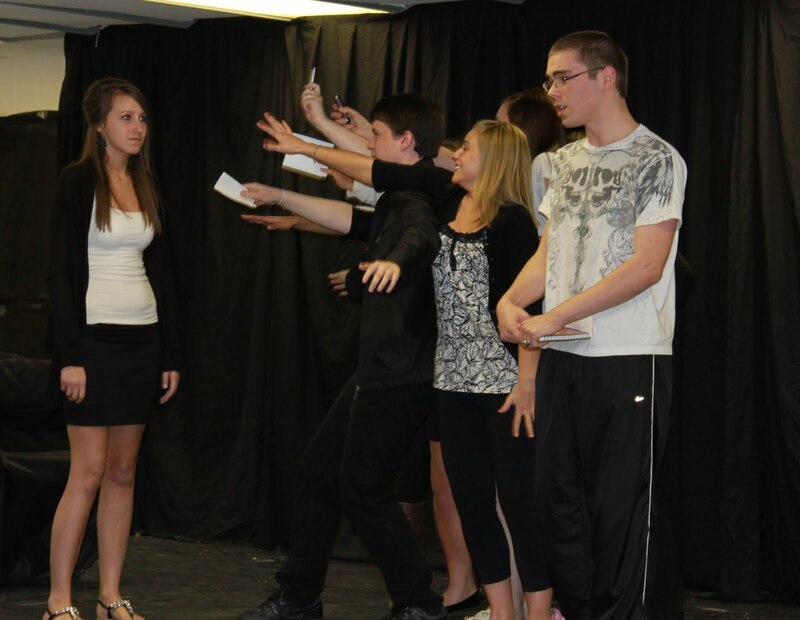 The Theatre Arts 120 Class and High School Drama Club performed their two plays for the general public last Thursday, May 12 in the school cafeteria. The plays were also performed at the New Brunswick Drama Festival on Monday, May 2. The plays won some recognitions and awards at the festival. The Theatre Arts Class' performance of The Way It Is was recognized for Ensemble Work, Outstanding Use of Set, and Outstanding Teacher Director Award to Ms. Cheryl Underhill. The High School Drama Club's Performance of 13 Ways To Screw Up Your College Interview was recognized for Ensemble Work, Outstanding Choice of Material, and Outstanding Student Directors Award to Michael McNeil and Melissa Underhill. The money raised from admission at last Thursday's performances was donated to the school's Free the Children Adopt a Village Water Project. For more photos from the performances, click here. Photo at top: A college applicant (Junior Vickers) makes the college admission officers (Kennedy Coughlan and Taylar Curtis nervous as they realize he is obsessed with attaining a succesful admission in 13 Ways To Screw Up Your College Interview. 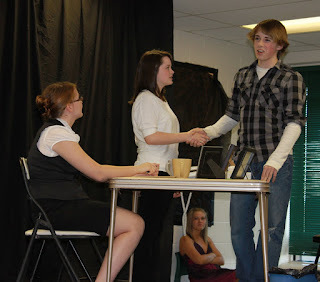 Photo above: A student (Nathan Hetherington) shares with the audience his thoughts on popularity and fame as other cast members act it out in The Way It Is.